It’s easy to get confused and even overwhelmed when considering all the different types and brands of cat litter that are available today. How do you choose which one to use? All cat litters fit into one of the several major categories, and each one has advantages and disadvantages when compared to others. This article will help you to narrow down your choices, but you are still likely to be faced with some trial and error before settling on the one that works best for you. Actually, you need to choose the litter that works best for you and your cat, as our feline friends can be picky about litter, and if they won’t use, it… well, you probably know the rest. These are the litters that look like sand, and in fact for a long time sand (and/or dirt) was what was used for cat litter. But clay is a lot more absorbent, and in the late 1940s, industrial absorbents were repackaged and clay cat litters became available commercially. With numerous other better performing choices, clay litters are not that popular any more, comprising only about 3% of sales at A Pet’s Life. It’s cheap. Clay litters cost the least. It’s dusty. And that’s silica dust, a known carcinogen when inhaled. It’s easily tracked. It sticks to cat paws quite easily, and gets tracked around the house. It’s heavy. You’ll be lugging it at least twice, once before and once after it’s used, and it’s like carrying a bag of sand. It’s not easy to dispose of. You can’t flush it or compost it, so you are likely left with putting it in the garbage. It’s not long lasting. You’ll use quite a lot, as it needs to be replaced often because of its limited ability to absorb liquid and to suppress odour. For this reason, many people put the litter box in the basement or garage, where the smell can be ignored longer. It’s environmentally unfriendly. Tons and tons of clay litters end up in landfills every year, and the extraction of clay for litters usually involves some form of strip mining. All this doesn’t make traditional clay litters sound so terrific, well, except for that cost thing. Additives such as baking soda and odour maskers, either already in the bag or as an extra that you sprinkle in yourself, are sometimes used to help with odour control. A traditional clay litter available at A Pet’s Life is Jonny Cat. In the the 1950s, someone got the bright idea that adding some form of bentonite clay to a traditional clay litter would be a big improvement. 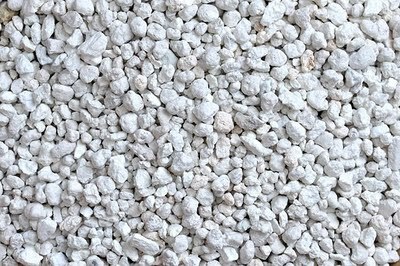 Bentonite, which in litters is nearly always either sodium bentonite or calcium bentonite, is a type of clay that forms from the weathering of volcanic ash. The advantage of bentonite in cat litters is that it will absorb several times its dry weight in liquid, and in doing so it expands as much as 15 times its original volume and at the same time forms clumps that can be scooped out without removing the rest of the litter. This is a terrific functional improvement over traditional clay litter. 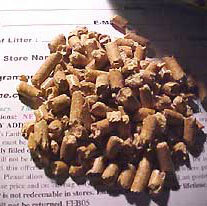 Clumping clay litters are about 13% of sales at A Pet’s Life. It’s easy to scoop. Using a sifting litter scoop, you can remove both feces and the urine clumps, leaving the rest of the litter in the box. It’s economical. Although periodically all the litter has to be removed, the same quantity of clumping clay litter will last longer than traditional clay litter. It’s not so smelly. Since regular scooping removes both feces and urine, it’s easier to live with it in close proximity. It’s potentially unhealthy, maybe even dangerous. There’s plenty of controversy about this, but some believe that inhaling that absorbing and swelling bentonite dust is a bad idea, and your cat will certainly inhale some of it. It’s dusty. Like other clay litters, that’s silica dust, a known carcinogen when inhaled. It’s easily tracked. It sticks to cat paws easily, and gets tracked around the house. It’s heavy. It’s just as heavy as traditional clay litter, although you will use less of it. It’s not easy to dispose of. You certainly can’t flush it, imagine that clumping and swelling going on in your plumbing! The only disposal option is the garbage. It’s environmentally unfriendly. Again, it’s extracted using some form of strip mining. Clumping clay litters available at A Pet’s Life include Cattitudes, and Dr Elsey’s Precious Cat. Silica gel litter is relatively new, and is sometimes referred to as crystal litter. It’s actually a granular form of sodium silicate, a substance with an incredible ability to absorb liquids, so it’s no surprise someone decided to market it as cat litter. It also has many industrial and commercial uses, such as those little packets you find in vitamin bottles. In use, you have to scoop out the feces every day, but urine is absorbed and just seems to vanish. It doesn’t, of course, it is just soaked up, and eventually the litter’s ability to absorb any more is gone. Then it’s time for a complete change. Some people find that a 2 kg bag will last for a month for one cat. Silica gel litters have gained much of a following, with only 2% of sales at A Pet’s Life. It’s economical. If a small bag lasts your single cat for a month, it might be the lowest cost alternative. It’s lightweight. No more lugging those big, heavy bags. It’s minimal work. Scooping feces and stirring the crystals are all that is needed, at least until it needs a complete change. It’s relatively dust free. Especially when compared most other types of litter. It’s fussy. It gives no warning when it’s “used up”. Usually, the only indication is the puddle of urine in the bottom of the litter pan. Then it quickly gets really stinky. Some silica gel litters have a portion of the granules change colour as they get saturated to indicate when it needs changing. It’s often not accepted by cats. While some cats are happy to use it, many refuse to do so. It’s sometimes messy. Those little round beads of silica gel can get rolling on the floor and go a long way. If your cat is a digger, and throws litter around, this might get really annoying. Look for the silica gel litters that are odd shaped, although there is a downside to these: some of the edges can be sharp and don’t feel very nice to step on, for you or your cat. If your litter box is in a high traffic area such as the bathroom or laundry room, you’re bound to step on one from time to time! A silica gel litter available at A Pet’s Life is Clear Choice. In recent years, a wide range and variety of plant-derived litters have become available. 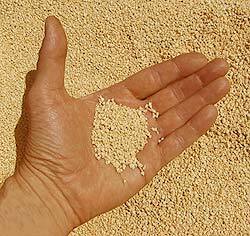 These biodegradable litters can be further divided into two types: pelleted or granular. Made from either wood or recycled newspaper, pelleted litter has an incredible ability to absorb liquids, and in doing so will crumble into an easily removable form. Sawdust that is a by-product of wood processing industries or recycled newsprint is formed under very high pressure into pellets, which are then thoroughly dried. 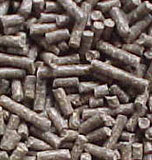 Wood pellets absorb urine so well that they are used extensively as bedding in horse stalls. Feces must be scooped from the cat litter box regularly, along with the pellets that become urine soaked and crumbly, leaving the remaining pellets behind. Pelleted biodegradable litters are about 25% of sales at A Pet’s Life. It’s relatively dust free. And whatever dust there is relatively benign. It’s non-tracking. Well, the pellets don’t track easily, although the crumbled bits do. It’s often rejected by cats. Some fussy cats just don’t seem to like the feel of the pellets on their paws. Pelleted biodegradable litters available at A Pet’s Life include Feline Pine, Crown Animal Bedding, Stall Dry, Yesterday’s News, and Good Mews. There are plenty of choices in this category: wheat, corn, barley, and pine, and it’s worth trying some different types to find the best one for you and your cat. These litters are made from the by-products of the human and animal food, as well as the wood processing industries, and so use materials that might otherwise be waste. Clumping properties come from the starch or cellulose components and odour is controlled by the natural enzymes and proteins in the litter. 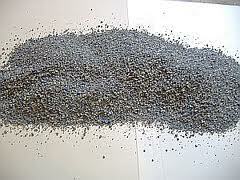 Granular biodegradable litters are far and away the most popular, currently having about 57% of sales at A Pet’s Life. It’s environmentally friendly. They are biodegradable and made from renewable resources. It’s lighter than traditional clay litters. It’s fairly long lasting. With proper daily maintenance, a bag will last twice as long as an equivalent size bag of clay litter. It’s somewhat dusty. Some users find these litters to be dusty, although at least it’s not silica dust. It doesn’t capture odours as well as clumping clay litters. Daily, if not twice daily scooping is necessary for odour control. Its natural odour may be offensive. Some people find the smell of the wheat, corn, pine, etc to be disagreeable. Granular biodegradable litters available at A Pet’s Life include Swheat Scoop,World’s Best, Feline Fresh, and Rainforest. 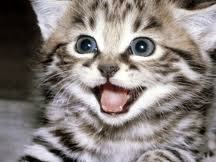 Use the right litter and you and your cat will be happy! 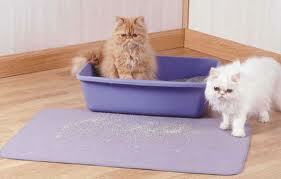 The bottom line is that there is no such thing as a perfect cat litter. It would really be great if there were, but it just isn’t so. They all have their advantages and their disadvantages. Some of these are inconveniences for cat owners and some are negatives for the cat. It really makes sense to choose the litter that is the most accepted by your cat, given the range of problems that can arise otherwise. It will likely take some trial and error to find the right litter for you and your cat. If you’re not sure where to start, talk to any of the A Pet’s Life staff for good advice and go from there. Good luck!